Apple TV 4K 32GB Media Streamer. 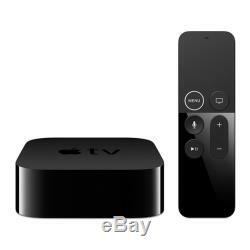 Apple TV 4K 32GB Smart Set Top Box, Black, iTunes + Siri Compatible, WiFi/LAN/Bluetooth. 32GB Apple TV 4K Smart Set Top Box Apple TV 4K lets you watch films and programmes in amazing 4K HDR quality. Streams live sport and news. And has great content from apps like BBC iPlayer, NOW TV and Netflix. 4K HDR sets a new standard. 4K gives you a crisper picture using four times more pixels than standard HD. High Dynamic Range (HDR) delivers brighter, more realistic colours and greater detail. From the hottest new film to your favourite TV programme, everything is more lifelike than ever. Apple TV 4K offers the live content you care about most news and sport. Youll find your favourite sports from apps like NOW TV and the latest news from apps like BBC iPlayer, so its easier than ever to watch the live programming you love. Watch Now: Watch Now serves up your favourite shows. And if an HD title in your library is released in 4K HDR, it automatically updates for free. Search: Find films and shows by entering a title or actor in the Search tab. Or ask Siri anytime no matter what youre looking for. No more typing to find exactly what youre looking for. Just ask Siri for a film, show, genre, actor or song you love. Siri also shines when youre not sure what you want. Just say something like Show me 4K films, and Siri delivers. The A10X Fusion chip provides a powerful platform for enjoying richer, more interactive games and apps. And youll find them all in the App Store for Apple TV. When you add accessories like game controllers and headphones, you can take your experience to the next level. Your photos, videos and music. Enjoy photos and videos from your iCloud Photo Library or shared albums on the big screen. Connect Apple Music to your home cinema. And let your friends and family share their photos and videos with AirPlay. Photos and Videos: Memories automatically creates collections of your best photos and videos, and Apple TV lets you see them in 4K. If you create Live Photo loops or bounces on your iPhone, you can share those on the big screen too. Apple Music: Apple Music gives you access to over 40 million songs on your Apple TV. So you can use it to power the party or just listen, explore and discover great music with family and friends. Share photos, presentations, websites and more. AirPlay is an easy way for you or your guests to wirelessly share whatevers on an iPhone, iPad or Mac in dramatic big-screen fashion. Control your smart home through Apple TV. Apple TV lets you use your iOS device to control HomeKit-enabled accessories remotely with the Home app. Videos play in stunning detail with picture quality thats more true to life. Enjoy great content from iTunes and apps on the App Store. Use the Siri Remote to find just what you want. Features faster performance than ever with the A10X Fusion chip for all your games and apps. What You Need: HD or 4K HDR TV. HDMI cable for HD streaming, or Dolby Vision-compatible HDMI cable for 4K HDR streaming. Subscription may be required to access some content. Live sport subject to blackouts. Not all content is available in 4K HDR. 4K resolution requires 4K-capable TV. Playback quality will depend on hardware and Internet connection. Title availability is subject to change. Some applications are not available in all areas. Application availability is subject to change. Subscription may be required to access some content. iCloud requires an iCloud-enabled device. Some features require iOS 11 and macOS High Sierra. Some features require a Wi-Fi connection. Some features are not available in all countries or regions. Access to some services is limited to 10 devices. Apple Music requires a subscription. Not all content is available in 4K HDR. Requires HDCP when playing protected content. HDMI Compatible TV WiFi Streaming Device. 1 x HDMI 1 x IR Receiver 1 x Wi-Fi. The item "Apple TV 4K 32GB Smart Set Top Box, Black, iTunes + Siri Compatible, WiFi/LAN/Bl" is in sale since Wednesday, December 20, 2017. This item is in the category "Sound & Vision\TV & Home Audio Accessories\Internet TV & Media Streamers". The seller is "scancomputers_int" and is located in Bolton.